In this article we will how do we handle drop-down lists into Struts Web Application and also how do we render response based on Drop-down list. Struts a web application framework also provides support for drop-down lists. Drop-down lists is a html attribute that holds multiple values. Out of these values, a single value is selected that need to be handled by struts, while an html form is submitted. This article will let you go with an example that will process drop-down list values selected and will process result according to these values. We will learn both techniques into this article. To initialize a drop-down list using Action class, we need to create a class member variable into the action class that will be passed into the struts tag <s:select> to its attribute “list”. This class member variable has a setter() methods to hold its value. A setter() method may be initialized using collection list. To access the value of this kind of list, we need to create one more class member variable and define this value into the attribute value “value”. 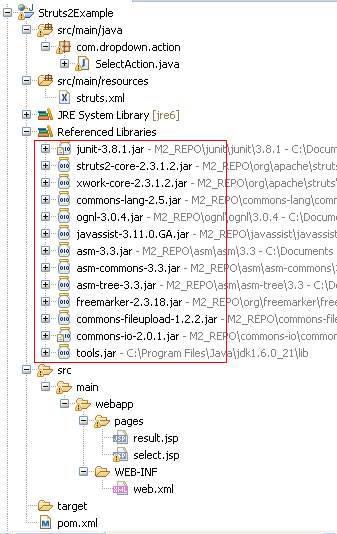 Figure 1 shows the struts 2 web application directory structure created using Maven repository into Eclipse IDE. The red rectangle highlight Struts 2 jar file required to run this web application. <s:select label="Choose your name from drop down"
Listing 1 defines select.jsp file that create two drop-down lists. One is created by defining a list into jsp file and second is created using action class, where “city” is a class member variable that is used to access the list elements, “defaultCity” is used to access the default value of the list from the action class. So, Listing 2 defines an action class for drop-down list application and accepts values submitted from “select.jsp” file and initialize “city” drop-down list also. It defines four class member variables “city” (a collection list to initialize a city drop-down list), “defaultCity” (a variable used to initialize city drop-down list as its default value), “yourName” (get values submitted from “select.jsp” file and process it to “result.jsp” file) and “yourCity” (get values submitted from “select.jsp” file and process it to “result.jsp” file). “city”, “yourCity” and “youName” are defined with their getter() and setter() methods, whereas “defaultCity” is define with its getter() method. Listing 4 defines xml file that configures a struts application. It defines a default package using <package> that is a sub-tag of <struts> tag. It defines “namespace” to default as “/” with package name “default” and extends “struts-default”. The <package> tag also defines two actions using <action> tag. First action is “selectAction” that lands to “SelectAction” class defined into package name “com.dropdown.action” and calls the method “display” of this class and loads the jsp file “select.jsp” defines into folder “pages”. The next action named “resultAction” also lands to the same class “SelectAction” and execute method “execute()” of this class and loads the jsp file “result.jsp” defined into folder “pages”. Listing 5 defines <web-app> tag as a root tag that holds <display-name> tag that defines the application name and <filter> tag that is used to define struts filter class. This filter class needs to be mapped to all landing urls for this application, so that all the requests can be managed using by “struts.xml” file. Figure 3 shows the values selected from “yourName” and “yourCity” drop-down lists and these values are displayed into “result.jsp” file using “execute()” method of “SelectAction” class. In this article, we learn about drop-down list and the ways to create a drop-down list using Struts framework. We went through an example that demonstrates all possible ways to create a drop-down list into a web application.